It’s all about Barcelona, the beach, and swim briefs. NIT – The New Swimsuit: NIT was created six years ago; since then the brand has been in constant evolution in the swimming sector as well as in quality and technology. All products are 100% Made in Barcelona. #2 is from the NIT site: the Mario style swim brief in pink. Men’s swimwear comes in several cuts, just like underwear: thongs, briefs, boxers, trunks, shorts. Some have drawstrings, some do not; the rough generalization is that the longer the legs, the more likely the swimwear is to have a drawstring, and vice versa. NIT swim briefs, like the ones above, usually lack drawstrings; they have a trim, clean, sleek look. Abs, packages, and lots of attitude. The NIT name. It almost always appears in all-caps, so I thought it must be an acronym. I spent hours searching NIT sites, but none explained it. Eventually it came to me thar it was just the Catalan word nit ‘night’. Sigh. (As an English speaker, I had to push aside the association to the noun nit ‘the egg or young form of a louse or other parasitic insect, especially the egg of a head louse attached to a human hair’ (NOAD)). The ES Collection. That’s es, as in the country code for Spain. The new campaign strives to come back to the begining, 1958 when the company was created. The video shows how ES Collection produces underwear in the old factory placed in Barcelona like fifty years ago, manually with the best fabrics to obtain the best fit and quality. “This campaign makes us feel proud of our beginings, which will push us to continue with our heritage. This feeling is the only way to achieve the best product ever”, says Eduardo Suñer, ES Product Manager. Catalonia (Catalan: Catalunya, Occitan: Catalonha, Spanish: Cataluña) is an autonomous community of Spain located on the northeastern extremity of the Iberian Peninsula. It is designated as a nationality by its Statute of Autonomy. Catalonia consists of four provinces: Barcelona, Girona, Lleida, and Tarragona. The capital and largest city is Barcelona, the second-most populated municipality in Spain and the core of the seventh most populous urban area in the European Union. Catalonia comprises most of the territory of the former Principality of Catalonia (with the remainder Roussillon now part of France’s Pyrénées-Orientales). It is bordered by France and Andorra to the north, the Mediterranean Sea to the east, and the Spanish autonomous communities of Aragon to the west and Valencia to the south. The official languages are Catalan, Spanish, and the Aranese dialect of Occitan. … A controversial independence referendum was held in Catalonia on 1 October 2017, using a disputed voting process. It was declared illegal on 6 September 2017 and suspended by the Constitutional Court of Spain because it breached the 1978 Constitution. Catalan is a Romance language derived from Vulgar Latin and named after the medieval Principality of Catalonia, in northeastern modern Spain and adjoining parts of France. It is the national and only official language of Andorra, and a co-official language of the Spanish autonomous communities of Catalonia, the Balearic Islands, and Valencia (where the language is known as Valencian, and there exist regional standards). It also has semi-official status in the commune of Alghero, situated on the northwestern coast of the island of Sardinia (Italy), where a variant of it is spoken. 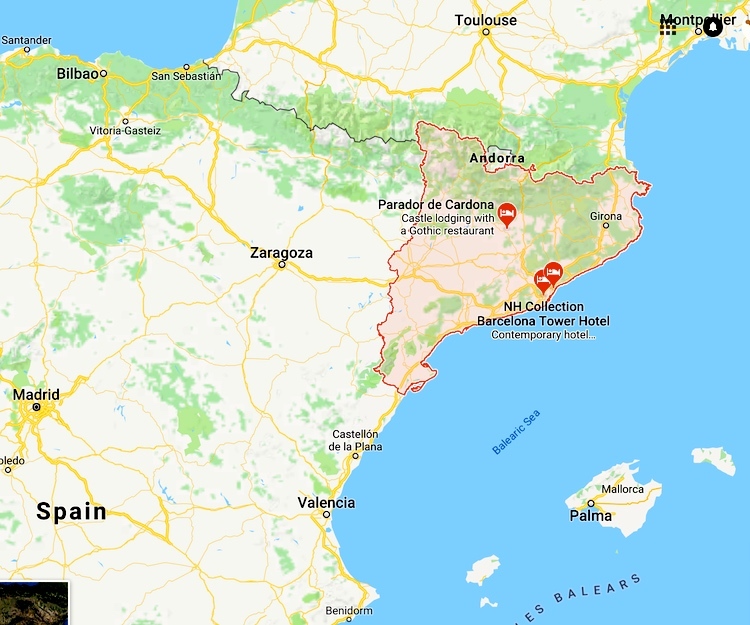 It is also spoken with no official recognition in parts of the Spanish autonomous communities of Aragon (La Franja) and Murcia (Carche), and in the historic region of Roussillon/Northern Catalonia, roughly equivalent to the department of Pyrénées-Orientales in modern France. All these territories are often called Catalan Countries. … Since the Spanish transition to democracy (1975–1982), Catalan has been institutionalized as an official language, language of education, and language of mass media; all of which have contributed to its increased prestige. In Catalonia, there is an unparalleled large, bilingual, European, non-state speech community. The teaching of Catalan is mandatory in all schools … There is also some intergenerational shift towards Catalan. The Balearic Islands are an archipelago of Spain in the western Mediterranean Sea, near the eastern coast of the Iberian Peninsula. The four largest islands are Majorca, Minorca, Ibiza and Formentera. There are many minor islands and islets close to the larger islands, including Cabrera, Dragonera and S’Espalmador. The islands have a Mediterranean climate, and the four major islands are all popular tourist destinations. Ibiza in particular is known as an international party destination, attracting many of the world’s most popular DJs to its nightclubs. There is one main gay beach in Sitges – Platja de la Bassa Rodona. It sits at the centre of Sitges’ row of beaches. It is often one of the busiest beaches along the strip. 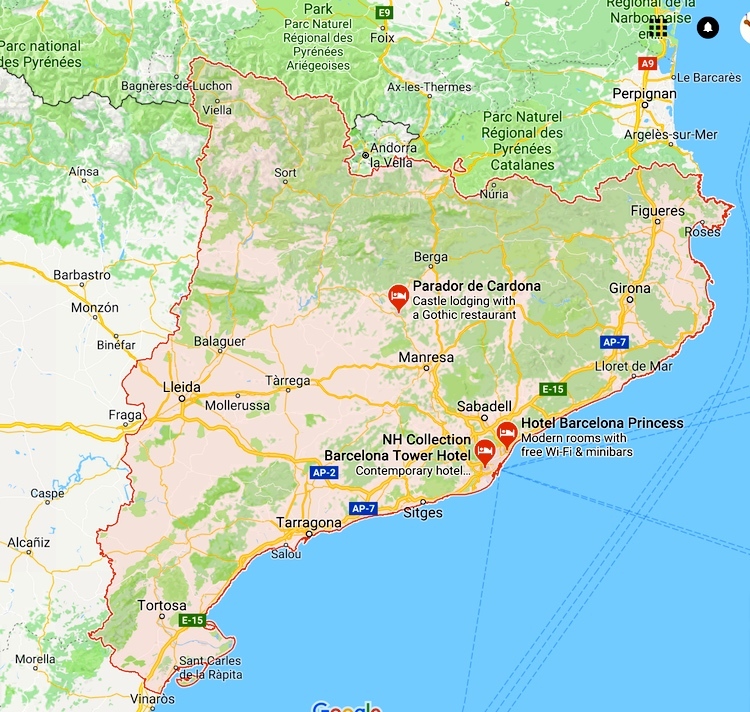 If you are a gay couple and you don’t fancy limiting yourself to just Platja la Bassa Rodona, you will feel comfortable on all of the beaches in Sitges. As a famously gay town, there is an open attitude towards openly gay couples throughout the town and beaches. 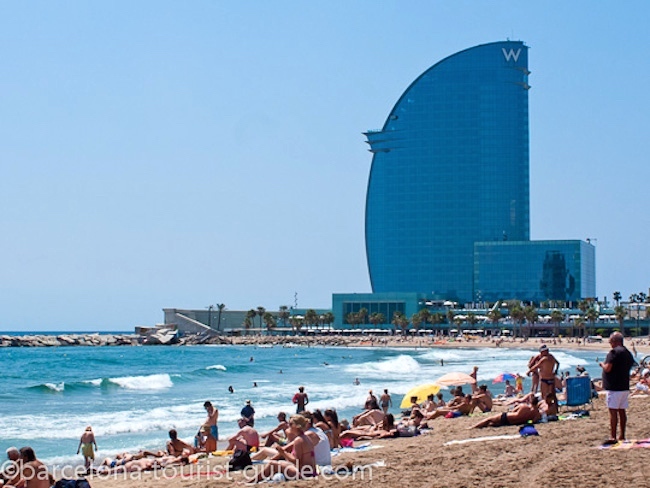 This page contains pictures and information on the golden sandy Barcelona beaches. There are 4.2 km of golden sandy beaches only 10 minutes from the city centre and 4 main beach areas. 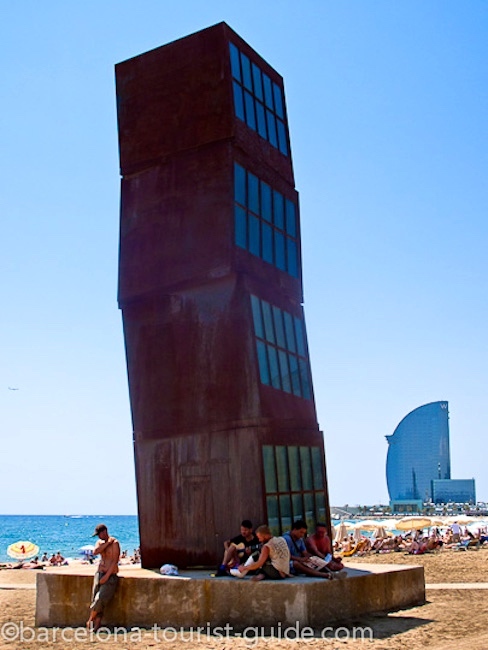 Amongst the attractions on Barceloneta’s beach are German artist Rebecca Horn’s “Homenatge a la Barceloneta” monument, and, where the beach gives way to the Port Olímpic, Frank Gehry’s modern “Peix d’Or” sculpture. W Barcelona, popularly known as the Hotel Vela (Sail Hotel) due to its shape, is a building designed by Ricardo Bofill is located in the Barceloneta district of Barcelona, in the expansion of the Port of Barcelona. … The building … stands in 7 hectares of land reclaimed from the sea surface in the construction of the new entrance to the harbour. Rebecca Horn (24 March 1944, Michelstadt, Hesse) is a German visual artist, who is best known for her installation art, film directing, and her body modifications such as Einhorn (Unicorn), a body-suit with a very large horn projecting vertically from the headpiece. She directed the films Der Eintänzer (1978), La ferdinanda: Sonate für eine Medici-Villa (1982) and Buster’s Bedroom (1990). Horn presently lives and works in Paris and Berlin. … In the 1990s a series of her impressive sculptures were presented in places of historical importance. Examples are the Tower of the Nameless in Vienna (1994), Concert in Reverse in Munich (1997), Mirror of the Night in an abandoned synagogue in Cologne (1998) and Concert for Buchenwald at Weimar (1999). In Weimar, the Concert for Buchenwaldwas composed on the premises of a former tram depot. The artist has layered 40 metre long walls of ashes behind glass, as archives of petrifaction. At the same time, the theme of bodily vitality, which the artist had been exploring since the seventies, was developed in site-specific installations that investigated the subject of the latent energy of places and the magnetic flows of space. This cycle comprises High Moon, New York (1991); El Reio de la Luna, Barcelona (1992); Spirit di Madreperla, Naples (2002). For the 1992 Olympics in Barcelona, Horn was commissioned to create the steel sculpture L’Estel Ferit. The sculpture L’Estel Ferit (The Wounded Shooting Star) consists of four twisted cubes, stacked seemingly at random. Most people refer to this popular landmark as “the cubes”, and it is a clear reflection of Barcelona’s penchant for ground-breaking art during the Olympic period. 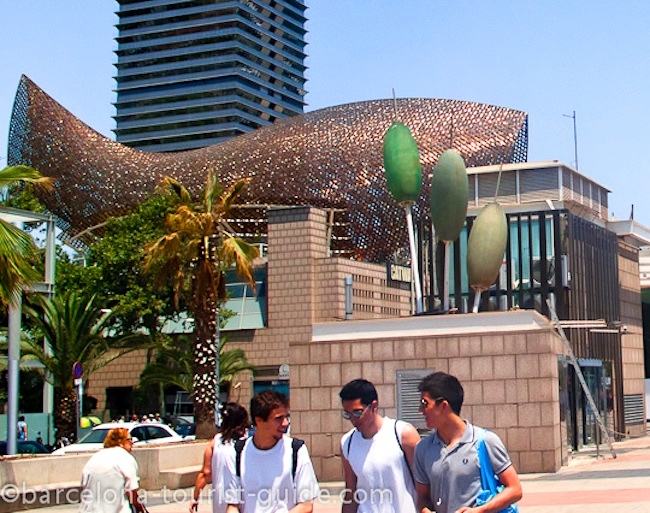 However, its symbolism is inextricably linked to the past of the Barceloneta district. Whatever the interpretation, there’s no denying that the artist created an impressive 10-metre-high sculpture, comprising four steel blocks that rise up from a concrete base. Each block, with its glass windows, comprises an individual module. Stacked one on top of another, these cubes look like they’re performing a fragile dance and are held up by chance. Locals and visitors alike don’t seem to fear the apparent instability of the structure, which is silhouetted against the background of the sea. Homage to Catalonia is George Orwell’s personal account of his experiences and observations in the Spanish Civil War. The first edition was published in the United Kingdom in 1938. The book was not published in the United States until February 1952, when it appeared with an influential preface by Lionel Trilling. … The [high-rise building] Torre Mapfre is located in this neighborhood, while the Hotel Arts, the Casino Barcelona and the “Peix d’Or” (goldfish), a large metal sculpture designed by Frank Gehry, are located at one edge of the Barceloneta neighborhood, close to the border with the Vila Olímpica del Poblenou. Palau Sant Jordi (English: St. George’s Palace) is an indoor sporting arena and multi-purpose installation that is part of the Olympic Ring complex located in Barcelona, Catalonia, Spain. Designed by the Japanese architect Arata Isozaki, it was opened in 1990. The maximum seating capacity of the arena is 16,670 for basketball, and 24,000 for musical events. It is the largest indoor arena in Spain. A swimming pool where you can show off your NIT swimwear. In any case, we’ve cycled back to Sant Jordi, St. George, in #1. June 23: Midsummer. Revetlla de Sant Joan: Celebration in honour of St. John the Baptist … takes place in the evening of June 23. Parties are organised usually at beaches, where bonfires are lit and a set of firework displays usually take place. Special foods such as Coca de Sant Joan are also served on this occasion. June 24: St. John’s Day. Dia de Sant Joan; Christian feast day celebrating the birth of Jesus’ likely cousin, Saint John the Baptist. This is considered to be the national day of the Catalan Countries. The coca is a pastry typically made and consumed in Spain. [It] is just one way of preparing a dish traditionally made all around the Mediterranean. 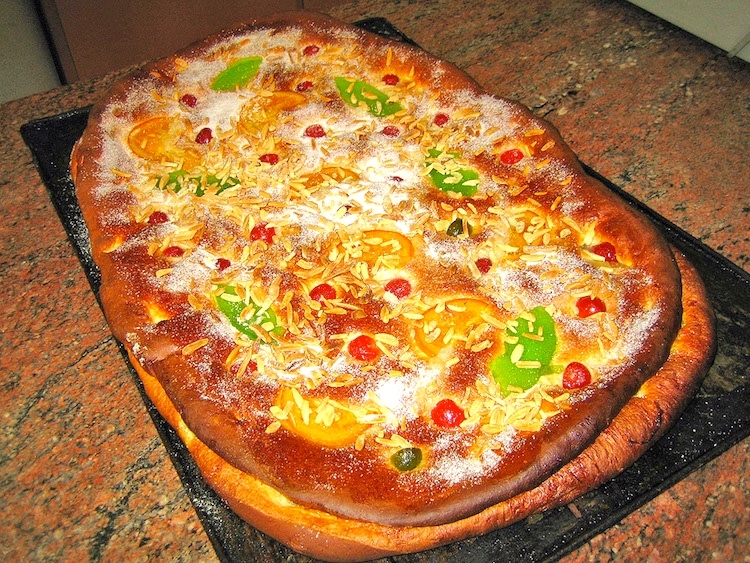 … Coca de San Joan, a sweet coca most typical of Catalonia, eaten on La revetlla de Sant Joan, St John’s Eve. Catalonian midsummer fruitcake. Patriotic and gay. This entry was posted on March 30, 2018 at 6:10 am and is filed under Art, Captions, Clothing, Gender and sexuality, Geography, Holidays, Homosexuality, Language and food, Language in advertising, Languages, Underwear. You can follow any responses to this entry through the RSS 2.0 feed. You can leave a response, or trackback from your own site.